Ruler "Jeanne d'Arc, Joan of Arc, The Maid of Orléans"
Jeanne d'Arc, the Standard-Bearer who Correctly Guides the Holy Grail War. She is a Servant of the Ruler class and is confirmed to appear as a protagonist in the novel of Fate/Apocrypha. She is a special Heroic Spirit summoned by the Holy Grail itself to act as the administrator of the Holy Grail War instead of the Church. Being summoned in the Ruler class also allows her to retain the memories of each repeating "game" unlike other Servants. She was first referenced in Type-Moon's earlier piece Kara no Kyoukai novel, when Mikiya Kokutou mentions her when he was discussing with Touko Aozaki about heroes who utilized the power of the Counter Force. 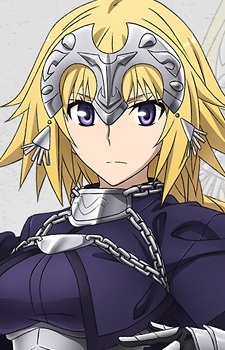 Jeanne also has a minor cameo in the second season of Fate/Zero.